What to do with Leftover Turkey? Here’s 12 Easy Leftover Turkey Ideas! Turkey Cranberry Sandwich from me (Girl Heart Food) – This Turkey Cranberry Sandwich is your answer! 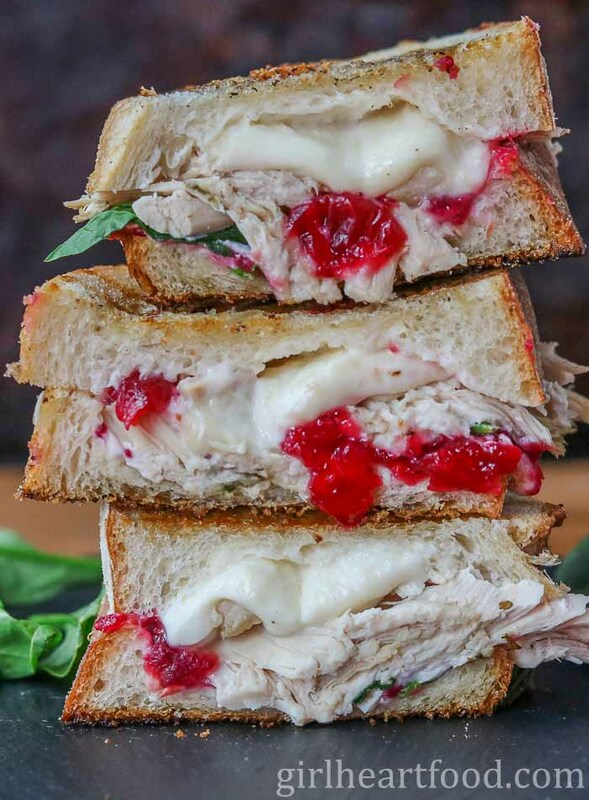 This grilled cheese sandwich combines lots of turkey, tart cranberry sauce, creamy goat cheese and melty mozzarella for one comforting bite! Turkey Shepherd’ Pie from The Cozy Cook (pictured below & photo credit) – Juicy turkey tossed with a medley of vegetables and gravy. All topped with cheesy mashed potatoes and baked until golden. Turkey Gouda Party Rolls from Nourish and Fete (pictured below & photo credit) – These turkey gouda rolls with honey mustard glaze are quick and easy to prepare. Such a unique way to use those Thanksgiving leftovers. Easy Stromboli Recipe from Lemons for LuLu (pictured below & photo credit) – Store bought pizza dough and leftover holiday turkey make this recipe a snap to prepare! Dump and Bake Turkey Tetrazzini from The Seasoned Mom (pictured below & photo credit) – This dump and bake turkey tetrazzini is the perfect way to use up leftover turkey and so so easy to prepare. Turkey and Dumplings from The Anthony Kitchen (pictured below & photo credit) – this one features leftover turkey (of course), carrots, celery, and homemade dumplings. So comforting and delicious! Kale and Butternut Squash Turkey Soup from Taste and See (pictured below & photo credit) – this turkey soup is hearty, healthy and absolutely delicious! With homemade stock, butternut squash, potatoes, kale, turkey, sage and thyme, it’s an easy and healthy dinner. Turkey Frittata from Fuss Free Flavours (pictured below & photo credit) – This leftover roast turkey frittata only takes a few minutes to make but tastes great and is a brilliant way of using up those turkey leftovers. Delish with a side salad too! Tuscan Turkey Tortellini Soup from Garlic and Zest (pictured below & photo credit) – This one has a savory broth and pillowy cheese-filled tortellini! Sounds good, right? Turkey Croque Monsieur or Turkey Croque Madame from The Flavor Bender (pictured below & photo credit) – A glorious turkey variation of a classic French sandwich, this Turkey Croque Monsieur is perfect for using up Thanksgiving leftovers! For a twist, top it with a fried egg for a Turkey Croque Madame. Easy Creamy Leftover Turkey Pasta Recipe from Salt and Lavender (pictured below & photo credit) – This easy creamy leftover turkey pasta recipe is ready in only 20 minutes. And who doesn’t love pasta? Turkey Quinoa Pumpkin Soup from Yang’s Nourishing Kitchen (pictured below & photo credit) – This turkey quinoa pumpkin soup is a nourishing cold weather soup with a bone broth base. Hope you find some inspiration with these 12 comforting recipes using leftover turkey. Great round-up, Dawn! While everyone loves those turkey sandwiches stuffed with stuffing and cranberry sauce, it’s nice to switch things up. I’m drooling over that shepherd’s pie! 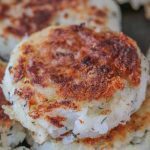 So many amazing ideas for leftover Turkey! We don’t celebrate Thanksgiving here in the UK but I am already dreaming of Christmas dinner and there are always some leftovers. Pinned this for later this year. We are having my parents in law staying with us so this will come in very handy! Have a nice weekend ahead, Dawn! Thank you Miriam! Hope you find something you love 🙂 Have a great weekend too! I think my favorite would be the rolls. Thanks for the idea! All fabulous ideas! You know my favorite is that sandwich with the cranberries and brie! I’ve also enjoyed making salads with greens, wild rice, roasted vegetables that are leftover, and using some cranberry sauce/chutney in a vinaigrette. It’s like Thanksgiving all over again. So true! The leftovers are just as good as the main meal! Thanks so much Mimi 🙂 Have a great weekend ahead! I will most certainly be needing this list in a few weeks Dawn! Sounds like you had a great Thanksgiving! Thanks for sharing! I bet 😉 Thanks Mary Ann! What a fantastic selection of ideas, something here for everyone, and to use up all of the largest turkeys. Thank you for including my frittata. Dawn, I’m totally with you on the dressing and gravy being the best part of Thanksgiving, but these turkey recipes are so welcome! It’s not Thanksgiving here for another 5-6 weeks, but i’M thrilled to have these recipes ahead of time. I love the idea of a turkey frittata, and, of course, any soup is perfect! Thanks for the ideas! Thanks Laura! I’m sure it’ll be here before you know it…the year is going way too fast! You know, I’ve got many of these in reserve already, but your sandwiches with cranberry sound amazing. And maybe even more using the spinach. How did I raise a family that refuses to eat the last handful of spinach every time, I’ll never know. Thanks for the ideas and Happy (early) Thanksgiving! Hahaha! Maybe it’ll change their mind about spinach if they have it on this sandwich 😉 Thanks Bill! I’m with you Dawn! Thanksgiving is my favourite meal behind Christmas dinner! And as much as I love freshly cooked turkey, the leftovers are usually my favourite! Turkey sandwiches and turkey soup are at the top of my list, but I love all the other recipes in this roundup! Thanks for sharing! And Happy Thanksgiving! Leftovers are SO good! Thanks so much David 🙂 Have a wonderful week ahead! I can’t wait for Thanksgiving so I have leftovers to make all these recipes! They all look so good but that Turkey Cranberry Sandwich is calling my name – yum! Such a great collection of recipes! I definitely need these and they all look so good. This has certainly gotten me excited for Thanksgiving! Thanks for including me in this roundup! These meals look better than the original roast turkeys haha. LOVELOVELOVE this roundup! I’m definitely going to save it for November and our Thanksgiving; I always cook about 300 times more food than I need :). Happy Thanksgiving, Dawn! Hope you’re having a fabulous weekend!